One of the main premises of the book is that the numbers quoted in the sources for the forces involved, are, for Jewish propaganda purposes, either greatly inflated for the Seleucids or much diminished for the Maccabeans. While the author accepts the low Jewish figures for the pre-purification of the Temple battles (first 4 above), when the Maccabeans were fighting a guerilla type war, he argues that after this point the Maccabean army would have grown due to the flocking of the Jews to a successful leader and their equipping with many captured Seleucid arms from those early victories, coupled with some home production. 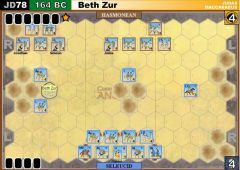 The author accepts that the Jews in the early battles were lightly armed and equipped, but he believes, from the way the later battles were fought, that in those battles the Maccabeans were able to field cavalry and heavier infantry. 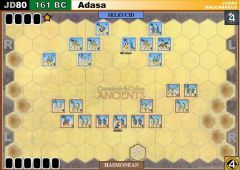 As for the numbers quoted for the Seleucid army, the author believes that most of the figures quoted for their armies are far too high. This is due to the loss of Seleucid territories in Asia Minor after the defeat at Magnesia in 190 BC, and the loss of eastern territories to the Parthians. Also, even when the Seleucid army was fully mobilized, such as for the Daphne procession in 165 BC, it came nowhere near the 120,000 troops quoted for the battle of Beth Zacharia in one source. 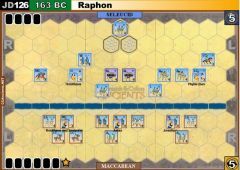 This eastern loss was the more serious and was the reason why Antiochus IV Epiphanes took the majority of the Royal army east to re-capture that territory. This left the western empire with little to contest the revolt. 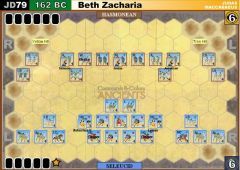 There were also problems with Seleucid power politics between rivals for the throne at various times so that the only time a full strength Royal army was able to campaign in Judaea was at the battle of Beth Zacharia. 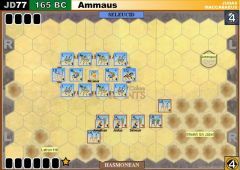 In most of the above battles only local raised auxiliaries, garrisons and mercenaries were available. 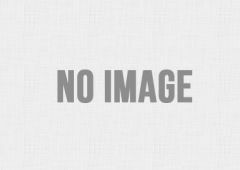 None of the above detracts from the valiant efforts of the Jews under Judas Maccabaeus, where certainly in the early battles, they were indeed heavily outnumbered and under equipped. When Judas is attached to a unit, the unit will battle with 1 additional dice in close combat. Either mark Judas with a special banner or use an eastern leader for him. 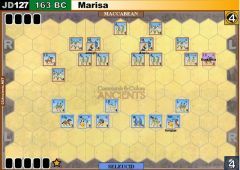 Due to the excellent ability of the Maccabeans to operate in loose order, any order requiring linked hexes, such as a Line command or Leadership card, may have one vacant hex as part of the chain. 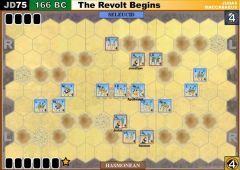 The battles may be played in order as a campaign. Historically the Maccabeans won 6-3. Consider a Maccabean victory as achieving Jewish independence, which is what happened historically shortly after these battles. 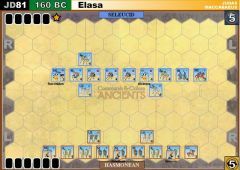 A Seleucid victory means Judaea remains under the rule of the decaying Hellenistic dynasty for a few more years. 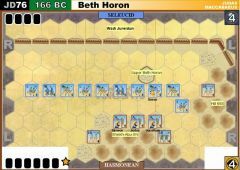 For the battles between the Jews and the Seleucids that occurred after the revolt see the “Hasmonean Dynasty” scenarios.